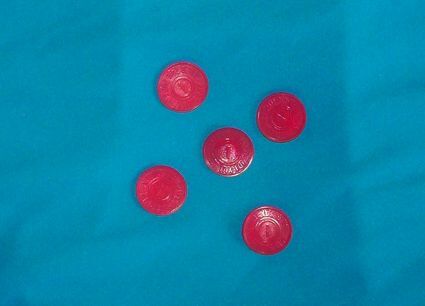 This is a set of Five Red Cent Missouri Sales Tax Tokens. I can remember my parents and grandparents saying (as if) "I do not have one red cent." People of the WWII age and their children know about "Red Cents" if they have seen them or not. You can google Red Cent and find out oodles about them. These were, as I understand, given out for tax payments. They were worth 1/2 cent when paying taxes. They were not used only in MO but other states as well. I got a big box of these at a garage sale in MO years ago (also had vote for Jimmy Carter metal button pins and other fun items). I sold several sets on ebay for a minimum of $4.95 as I am asking here. The coins measure just over 3/4" and are about the same size as a nickel, but not as fat as the nickel is. Our items are not returnable and are non refundable. Please look closely at the photos. Coins may be warped or a bit discolored from time, they are made of plastic.